The collapse of the Silver Bridge happens to be the worst bridge disaster to have ever happened in the United States. The sad incident which occurred on December 15, 1967, in West Virginia claimed the lives of 46 people. The damage was as a result of a broken eye-bar (I-bar) that was used to construct the bridge. An eye-bar is a type of straight metal bar with a hole at its end where other metal bars can be connected. [source](https://en.m.wikipedia.org/wiki/Eyebar) It is usually used to connect the different parts of a bridge. In the investigation on the collapse of the Silver Bridge, it was later got to know that there had been a little crack in the eye-bar that was used in the construction of the bridge. Due to traffic and a heavy load, the little cracked eye-bar gave way and led to the collapse of the bridge. Isn’t it fascinating for us to know that a defect of just 2.5 mm deep is enough to wreak havoc resulting in the loss of many lives and properties? A similar case was also witnessed in 1968, in the construction of the Melbourne Bridge in Australia. The architects and engineers committed a simple calculation error which led to a “not-too-simple” repercussion. It was so big a mistake that led the steel girder box of the bridge to become unstable and expand uniformly when heated. This eventually caused the entire length of the bridge to fall off. ! [golden-gate-bridge-388917_1280.jpg]( ) The Golden gate bridge in San Francisco, US. An example of a suspension bridge. 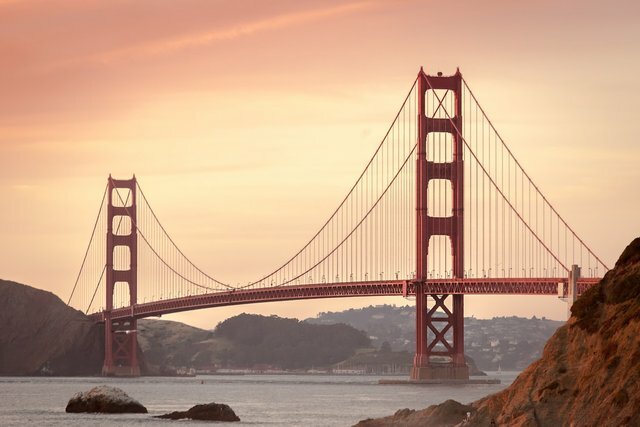 Source:[pixabay, CC BY-SA 2.0](https://pixabay.com/photos/golden-gate-bridge-san-francisco-388917/) Structures are meant to be stable irrespective of the forces that are acting on or against them. Taking skyscrapers, for instance, regardless of the gravitational and wind forces against them, they should be constructed in such a way as to be able to withstand those forces. A suspension bridge should be stable despite the force of gravity pulling it down and the constant movement and thrust it sustains from trucks and cars. One of the major point of this discussion is understanding what allows the stability of such structures irrespective of the forces against them. In that regards, there are two major aspects that ensure the stability of structures: they are basically the equilibrium of forces acting on rigid bodies and the elastic effects on non-rigid bodies. These are the properties that govern how structures can deform. When the physics behind these properties are properly implemented, they tend to be the subject of numerous articles in newspapers and journals, so also is the case if they are not properly done. So, this is a sequel to my last post on understanding the effects of forces in structures and microstructures in which I explained what structures are, the ideas behind building of structures, how structures do stay up, the center of gravity, coplanar forces and various ways of determining the resultant of two or more forces. In the concluding part of the post, I wrote that there are still many more effects of forces on a structure, some of which are non-coplanar forces, moments of force, like that in a tower crane and many more to come. So, I’ll be shedding more light into some of those effects, starting with Non-coplanar forces i.e forces not acting at a point. The principle of moments explains that when a body is in equilibrium, the sum of anticlockwise moments about the pivot (balance point) is equal to the sum of clockwise moments for example, where F and f are in Newtons and x and y are in meters: #### F1x1 + F2x2 = f1x1 + f2y2 (Nm) If an object is in static equilibrium, it remains stationary (at rest) or moving at constant velocity because no resultant force acts on it. A body is in equilibrium when the net forces acting on it are zero and also when the net moment of these forces is zero. A Tower crane is a very good example of the application of moment of forces. 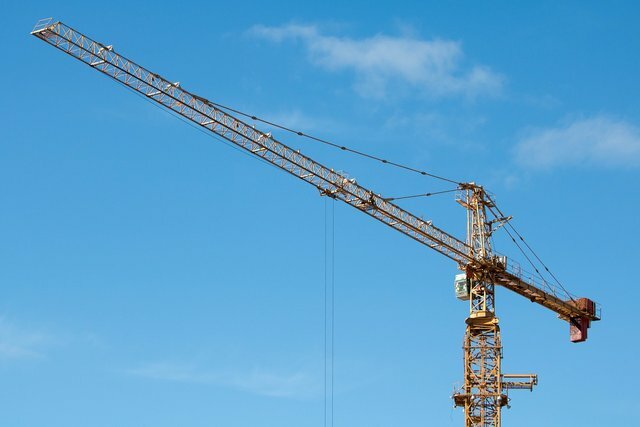 A tower crane is a very tall machine (up to 150 feet) for lifting heavy tools and objects such as concrete, steel and various types of building materials for the purpose of constructing giant structures. A simple diagram of a tower crane with its caption is drawn below. ! [industry-3200185_1280.jpg]( ) A tower crane. Source:[pixabay, Author: HeungSoon; CC BY-SA 2.0](https://pixabay.com/photos/industry-tower-cranes-sky-equipment-3200185/) Diagram of a tower crane, displaying the main forces involved. The effect of gravity on the mass of the tower crane will produce a downward force **WT** which acts directly through the tower base. The jib (i.e the horizontal arm of the crane) stretches outwards from the tower on two opposite sides. If observed carefully, it will be seen that the jib extends further outwards on the side used for lifting the load. So, the centre of gravity of the jib lies a distance **dJ** outwards on this side of the tower, and there is a force downwards of **WJ** due to the weight of the jib. Tie cables are provided to help support the jib. A load **WL** is being lifted at a distance **dL** along the jib from the centre of the tower. A concrete block acting as a counterbalance is positioned at distance **dC** on the opposite side, creating a downward force **WL**. ! [IMG_20190320_220513.jpg]( ) A simple diagram of a tower crane drawn by me, showing the main forces involved. Using the principle of moments, we choose a fulcrum or pivot point about which to take moments. We take the fulcrum as the point where the jib is fixed to the tower crane. Though, at an engineering point of view, it is crucial to include the tie cables to absorb much of the strain on the jib, but that will be avoided in this instance when calculating the moments. It can be assumed that they are well proportioned, so that the tensions in each are the same. 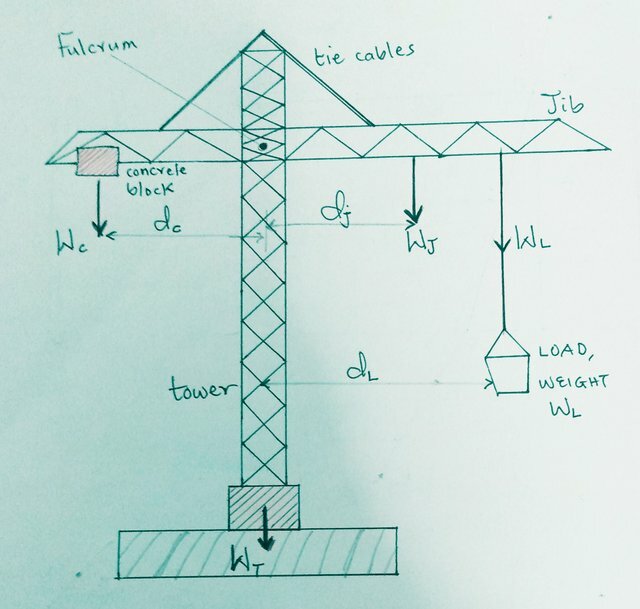 Using the principle of moments, then we arrive at: #### (WC × dC)concrete = (WJ × dJ)jib + (WL × dL)load So, for the tower crane to remain balanced and not topple, the turning moment of the block on the left of the equation must counterbalance the sum of the turning moment of the jib and the load on the right. When you watch a tower crane in action, you will observe that the load is moved into the proper position not only by turning the crane but also by moving the load away from the equilibrium position that’s already been calculated. We can now see the need for the tie cables. As the load moves away from the equilibrium position, the tie cables take up unequal tensions so that the turning moments remain balanced. The forces in the tie cables must be balanced by forces exerted by the tower crane. The concrete block counterbalance can sometimes be moved after erection, but it can’t be precisely positioned to balance the load. In addition, there will be some extension and bending of the crane parts to “take up” the forces. A full calculation is complicated. In practice, a tower crane is tested for stability with appropriate loads before being put to use. Let’s look at this sample problem to understand how tower crane operates in real life. Assume a tower crane is used to lift a load of 50 bags of cement each of 50 kg. The concrete counterbalance, a distance dC of 15 meters from the crane’s fulcrum, is of mass 3000 kg. The jib of the crane creates a downward force WJ of 5 000 Newtons at a distance dJ of 5 meters from the fulcrum. At what distance from the fulcrum must the load be lifted for the tower crane to be in equilibrium? For us to know the distance from the crane’s fulcrum at which the load must be lifted to attain equilibrium, we employ the principle of moments: #### (WC × dC)concrete = (WJ × dJ)jib + (WL × dL)load And from elementary physics, the weight (W) of a body is given as the product of its mass (m) and the acceleration due to gravity (a constant “g” that is approximately 10 m/s2) i.e W =m×g = mg. The mass of the concrete MC is given in the question as 3 000 kg; So, the weight of the concrete, WC will be the product of the mass of the concrete MC and the acceleration due to gravity (g) i.e #### WC = MC × g = 3 000 kg × 10m/s2 = 30 000 Newtons. The distance between the concrete and the fulcrum, **dC**, is given as 15 metres. **WJ**, which is the weight of the jib is given as 5 000 Newtons. The distance between the jib and the fulcrum, **dJ**, is 5 meters. The weight of the load, **WL**, can be obtained by multiplying each of the 50 bags of cement by 50 kg and then multiply the result with the acceleration due to gravity which is approximately 10m/s2 i.e: #### WL = 50 bags × 50 kg × 10 m/s2 = 25 000 Newtons. Let us now substitute all these values into the formula for calculating moments, i.e: #### (WC × dC) = (WJ × dJ) + (WL × dL) #### 30 000 × 15 = (5 000 × 5) + (25 000 × dL) #### 450 000 = 25 000 + 25 000 dL #### 25 000 dL = 450 000 – 25 000 #### 25 000 dL = 425 000 #### dL = 17 metres. So, this means that the distance from the fulcrum by which the load must be lifted for the tower crane to be in equilibrium is 17 meters. All these calculations really go a long way in ensuring the stability of structures not only for the tower crane but other structures such as the suspension bridge. An engineer constructing a suspension bridge like that shown in the diagram would take cognizance of all the forces acting at a point inside the structure and the turning moments of the forces. ! 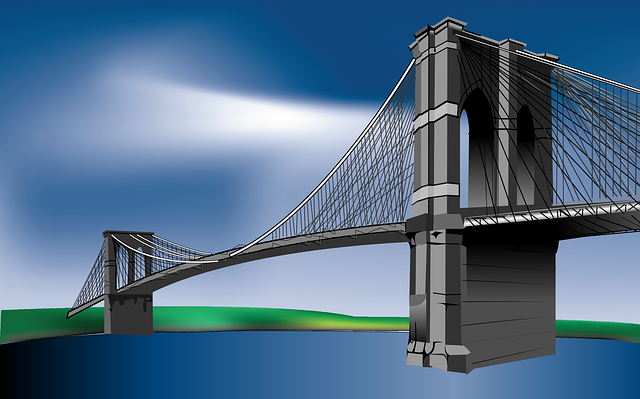 [suspension-bridge-146870_640.png]( ) Brooklyn bridge Source:[pixabay, Openclipart; CC BY-SA 2.0](https://pixabay.com/vectors/suspension-bridge-brooklyn-bridge-146870/) The engineer would also take account of the forces of tension within the steel wires carrying the roadway, and the forces of compression within the reinforced concrete towers and then select those materials that would endure the huge forces exerted on the bridge. Steel is a material known to be strong enough to withstand large tension forces as compared to concrete which is most suitable only for compression forces. An experienced engineer will never suspend a bridge with concrete rods, despite the fact that loading pre-stressed steel into concrete does allow the ensuing composite material to withstand forces of both tension and compression. It is evident then, that to select the best materials for a particular structure, we need to look out more about the individual properties of the materials. If a structure such as a skyscraper or a tower is vertical, the gravitational force on it acts through the center of gravity and also through the center of its ground area. In a condition where the tower tilts, it will still maintain its balance and stay upright so far the walls remain undamaged until the center of gravity stops to lie over the contact area of the tower with the ground. If the tower should go beyond this point, then it will topple. ! [IMG_20190320_220801.JPG]( ) An illustration by me showing the stability of a tower. At that stage, there is now a moment of the gravitational force which is acting about the contact edge of the tower as a pivot point and cause the tower to tilt further and eventually collapse if the situation is not salvaged. It was for this danger of toppling, that the civil engineers had to bring the Leaning Tower of Pisa closer to the vertical position. This is a really good post that deserves strong rewarding . If you had turned your post into a question and answer, it would have been ideal material for StemQ as well. Thanks for coming by @irelandscape. Actually, It didn't occur to me to turn the post into a question and answer maybe cos I've actually not written a post in such format before and secondly, I don't really understand much about StemQ and how it works. I'll so much appreciate if you can run me through the process, guidelines and what it's entirely all about. StemQ us a Q&A app for stem subjects. People can post questions and wait for others to provide answers. But it's also possible for the same person to answer his/her own question. This can be an interesting way to write about a particular topic. Our Third Mainland Bridge in Lagos Nigeria is consistently overloaded, I just hope it's not a disaster waiting to happen. Well, I hope so too. The more reason the bridge needs to be properly maintained. I am sure the load the Third Mainland Bridge was carrying or estimated to be able to carry during the time of construction isn't as much as the present load it's carrying. The population of Lagos keeps doubling while special attention isn't given to the bridge. Just like you've said, I hope we are not all sitting on a ticking time bomb that's about to explode. Although it seems to carry out some periodical checks on the bridge to ensure reliability, I just hope that it is a thorough one. If that's the case, then that's fine. I hope it's a thorough and effective check too. Atimes crossing the river niger bridge in Onitsha gets me trembling. Heavy truck are always moving on it. There was a time it cracked, however, it has being fixed. Thanks, ikchris. You are right. The maximum load the bridge can carry should be maintained and not exceeded. Although i have never really being a structure person, i must say i have learnt a great deal for your write up especially the concepts behind the leaning tower of pisa. I initially thought the leaning effect of the tower was intentional. Awesome write up! @sunkanmi02, thanks for coming by. I'm glad you were able to learn a thing or two from the post. Congratulations! This post has been upvoted from the communal account, @minnowsupport, by emperorhassy from the Minnow Support Project. It's a witness project run by aggroed, ausbitbank, teamsteem, someguy123, neoxian, followbtcnews, and netuoso. The goal is to help Steemit grow by supporting Minnows. Please find us at the Peace, Abundance, and Liberty Network (PALnet) Discord Channel. It's a completely public and open space to all members of the Steemit community who voluntarily choose to be there. You are welcome, @lemouth. I'm glad you found the post explanatory enough.